A truly plastic free, leak-proof divided stainless steel lunch box. It is a 3 in 1, multi-functional lunch box allowing you to transport your lunch, cook dishes in the oven, and even store pre-cooked meals in a freezer. Includes a handy stainless steel fork for on the go. A removable divider allows you to organise your food with ease. The first truly plastic free, leak-proof divided stainless steel lunch box. It is a 3 in 1, multi-functional lunch box allowing you to transport your lunch, cook dishes in the oven, and even store pre-cooked meals in a freezer. Includes a handy stainless steel fork for on the go. 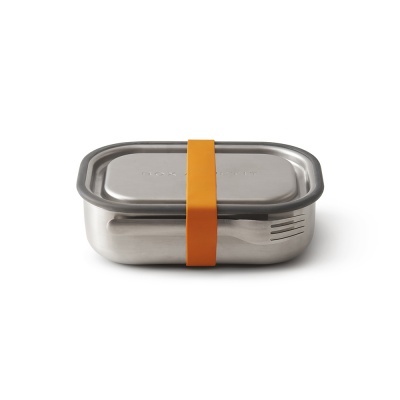 The stainless steel lid is specially designed with an over-mould silicone to prevent any spills or leaks. A vacuum valve on the lid provides extra security and leakproof functionality. Lift the valve to open and push down to securely close. 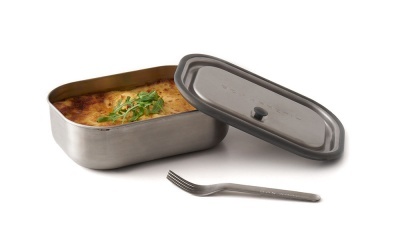 The box, fork and food divider are made from quality 304 (18/8) food-grade stainless steel. The strap and mould are made from BPA free food-grade silicone. A stainless steel fork is held in place by a silicone strap, the strap also gives added reassurance that the lid cannot open unintentionally. A removable slider divider allows you to organise your food with ease. 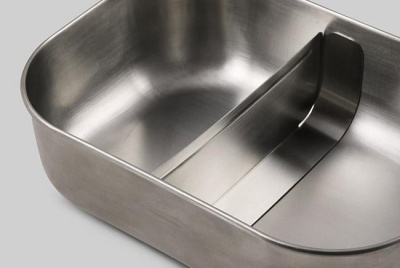 Specs: Stainless steel (304/18-8), including a silicone strap, a stainless steel fork and slider-divider to separate foods. L 20cm W 15cm H 6.5cm / L 7.87" W 5.91" H 2.56"
This Stainless Steel Lunch Box is leakproof. To ensure the box is locked & sealed properly, check that the edges of the base and silicone seal on the lid are clean and dry. Firmly push the lid down on all sides and then press the valve down. Secure the box with the silicone strap. The base and slider/divider are oven safe; however please note do not put the lid in the oven and note that using the box in the oven could cause discolouration. 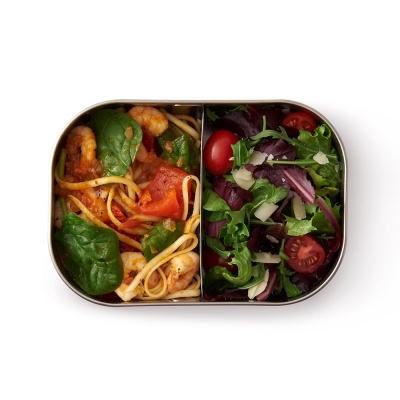 This lunch box is freezer safe for food storage. 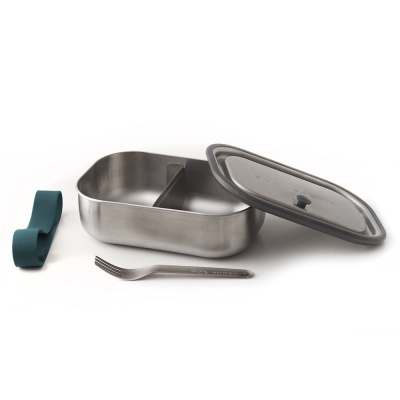 The Steel box base, the fork and slider-divider are dishwasher safe. Please ensure you always wash the lid and strap by hand only.